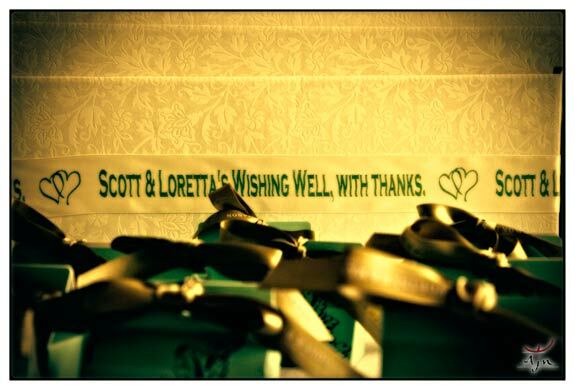 As a flower designer, we have to admit that the wedding of Loretta and Scott were one of the most stimulating ones. 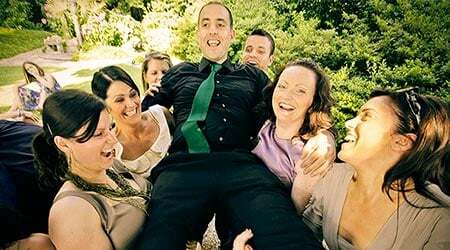 It was months of work, 3 meetings with the bride and groom, lots of emails with decisions and re-decisions before arriving at the final go. 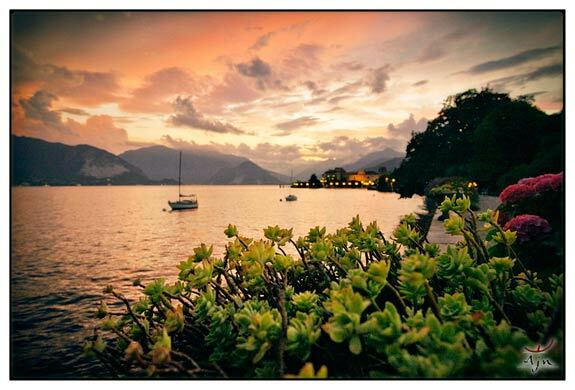 Loretta and Scott are a very nice couple from England who decided to get married at Lake Maggiore. 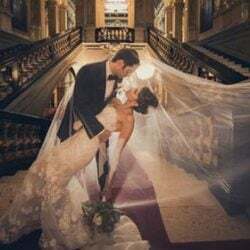 Both have origins in Italy, both are born in London but the bride’s parents are from Parma and Piacenza and the groom’s father is British but his mother is from Salerno. 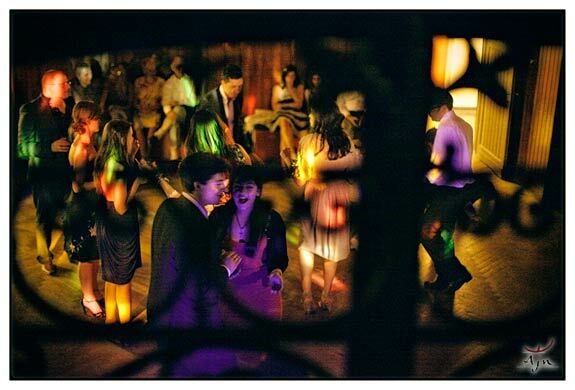 Both have Italian origins, that’s why they met for the first time in St Peter’s Italian church in London. After 9 years finally they wished to become husband and wife. 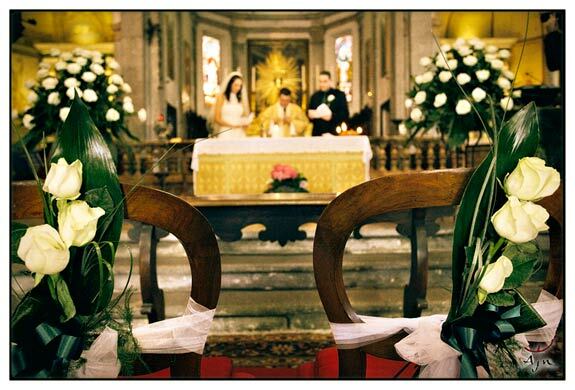 Their decision to come to Italy for the wedding was crystal clear, but where? 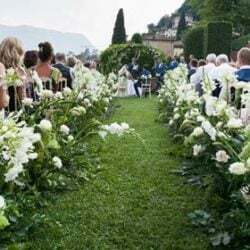 They wanted somewhere which is neither near his or her family backgrounds, so it was the beautiful setting of Villa Rusconi Clerici and the fantastic landscape around Lake Maggiore. 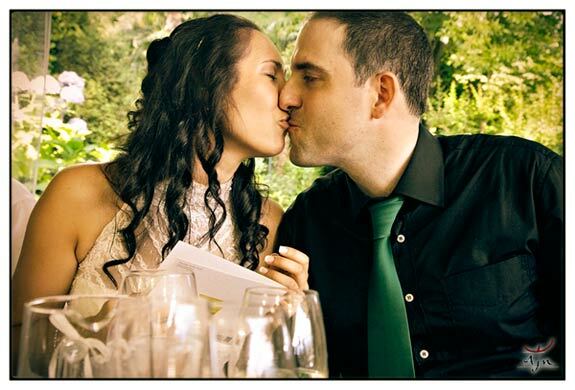 Their choice of photographer was also made with the highest attention, he had to be professional, very special and with a photo-reportage style. Indeed, it is very important to select a good photographer, because what he is producing will last forever. 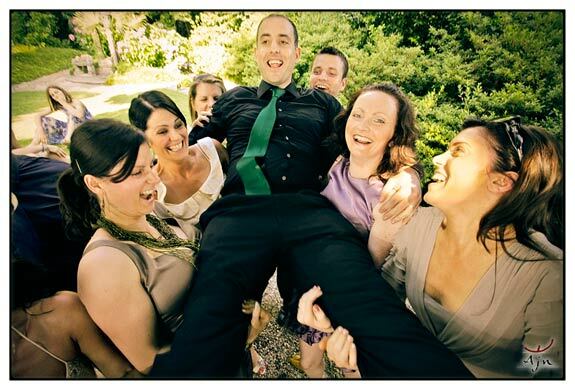 So it was Luca Rajna, one of the most appreciated and best photographers in the lakes area. Have a look yourself www.ajn.it. 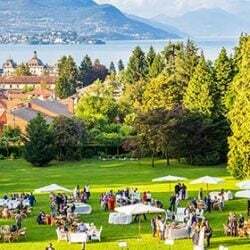 The church for the wedding was San Leonardo’s at Pallanza, built in 1537, it overlooks the Piazza San Leonardo and the lakeshore. For the flowers Loretta wanted a focus on the main altar with 2 large compositions of ivory Rose Vendela on some high basements of metal. 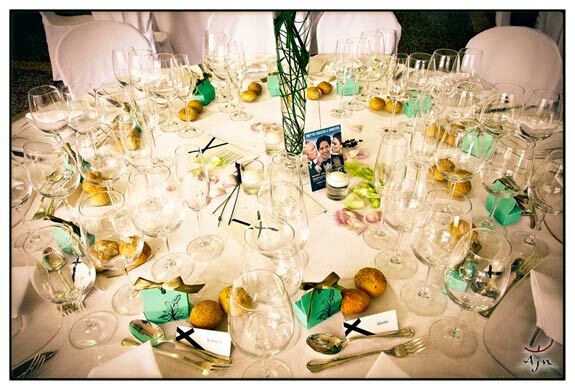 Then some smaller compositions combined with tulle and organza in white, emerald green and ivory on the ends of each row of pews. This was the colour theme throughout all the decoration, sometimes added by a touch of lilac. 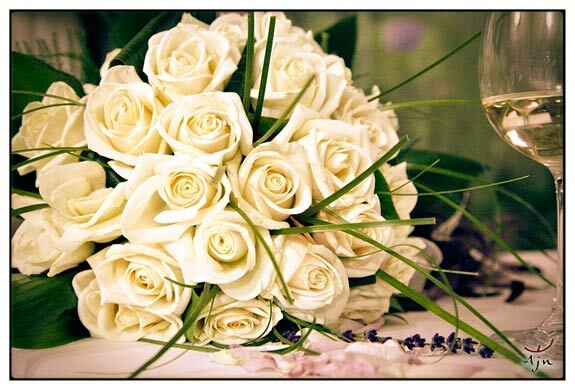 The bridal bouquet of Loretta was round and very compact and resembled the colours used in church, from the white and ivory of the roses into the emerald green of the ribbons that hold it all together, decorated with some pearls here and there. A fantastic advantage of this church was the small walking distance to Villa Rusconi Clerici, just 300m. 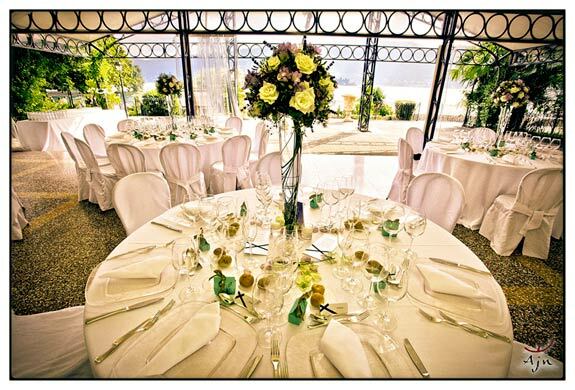 For Loretta and Scott it was easy to decide for the Villa Rusconi Clerici, they were in love with the location from the beginning. It is really a wonderful place as the villa is situated directly on the shore of the lake, has splendid views and a huge garden. 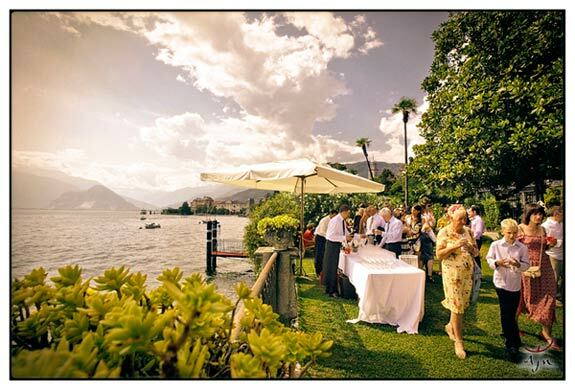 As the wedding day was very warm, the welcome drinks were prepared outside on the lakeshore. Accompanied with some wonderful music from a string quartet. The dinner itself was inside the white gazebo, this is an elegant structure of tents finished with metal that was normally used at the beginning of the 19th hundred century. 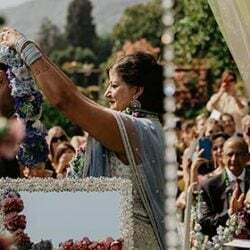 Here the theme of the wedding was taken from well known Italian-American films like “La dolce vita” from Federico Fellini, “Once upon a time” from Sergio Leone and “Cinema Paradiso” from Giuseppe Tornatore. 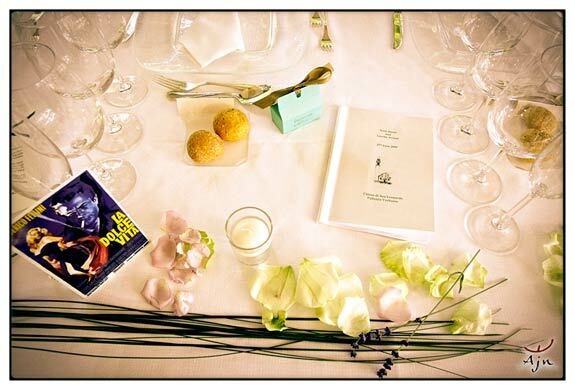 For the decoration on the tables we used compositions that were based on glass structures and around them petals of roses and tealights. But I surely will return and speak more about this part of the marvellous decoration. When the dinner ended, everybody went over to the tavern where they danced until the early morning. 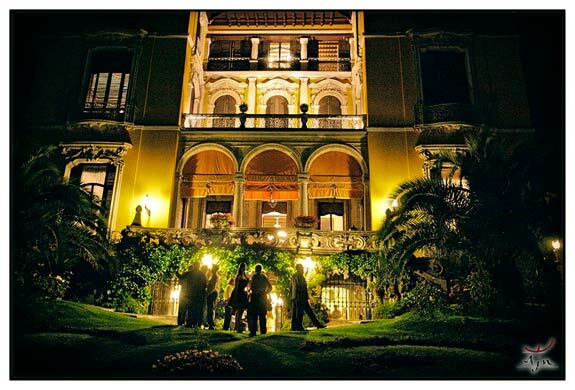 During the evening, Villa Rusconi Clerici has a very special attraction with all the lights you see along the lake and with a quiet island in front of the villa that gives a romantic touch. What is more exciting for a flower designer than to work in such a wonderful location? 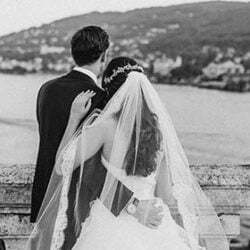 Click here to see the PHOTO GALLERY of the whole wedding, 40 fantastic photos may be admired which were chosen by the photographer Luca Rajna as the best of this splendid wedding. 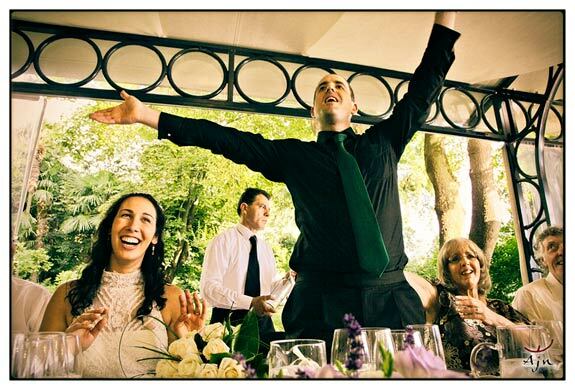 I would like to finish off with a citation of what Loretta and Scott did tell me after the wedding day: “This day was much nicer then we ever were expecting it, this day was a dream”. 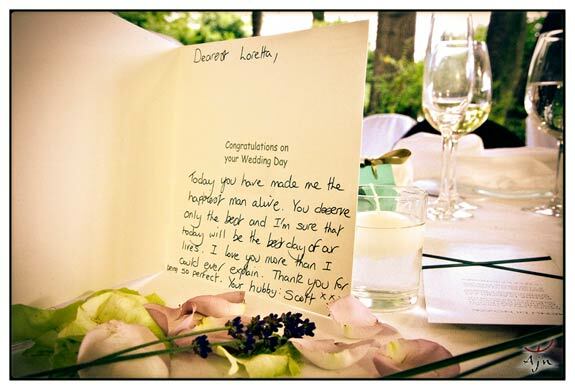 We wish Loretta and Scott all the best and much happiness; this comes from all of our Italian Lakes Wedding team. 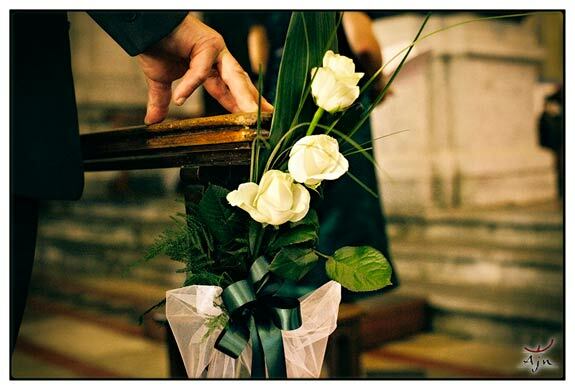 For more information about weddings at Villa Rusconi Clerici please CONTACT US.